Azure Site Recovery (ASR) now supports managed disks. This follows the announcement of Azure’s support for managed disks in February. With the integration of managed disks into ASR, you can attach managed disks to your machines during a failover or migration from on-premises to Azure. Simplified disk management for Azure IaaS VMs by removing the hassle of managing storage accounts for your machines after failover to Azure. Improved reliability for Availability Sets by ensuring that the disks of the failed over VMs are automatically placed in different storage scale units (stamps) to avoid single points of failure. To attach managed disks to your machine on a failover, set “Use managed disks” to “Yes” in the Compute and Network settings for the virtual machine as shown below. Managed disks can be created only for virtual machines deployed using the Resource manager deployment model. Virtual machines with managed disks can only be part of availability sets with "Use managed disks" property set to "Yes". Learn more about managed disks and availability sets. If the storage account used for replication was encrypted with Storage Service Encryption (SSE) at any point in time, creation of managed disks during failover will fail. In such a scenario, you can either set "Use managed disks" to "No" in the Compute and Network settings for the virtual machine and retry failover or disable protection for the virtual machine and protect it to a storage account which did not have Storage service encryption enabled at any point in time. Learn more about managed disks and Storage service encryption. For Hyper-V VM’s managed by/not under the management of System Center VMM, set the option to use managed disks only if you intend to migrate your machine to Azure. This is because failback from Azure to on-premises Hyper-V environment is not currently supported for machines with managed disks. Data from on-premises VMs replicates to a target storage account in Azure, as is with the experience today. 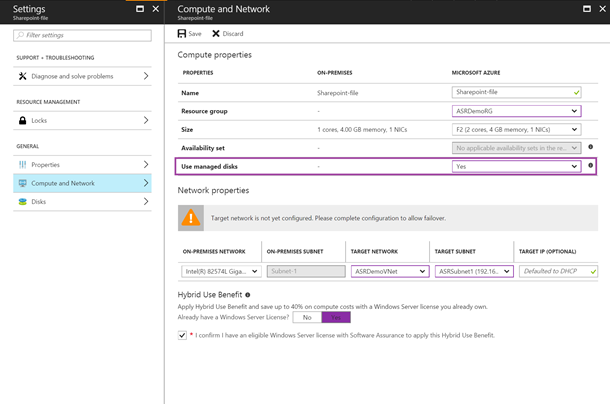 Managed disks are created and attached to your machine only on a failover to Azure. Disaster Recovery of Azure IaaS machines with managed disks is not supported currently and will be made available in the future. The latest Deployment Planner tool, version 1.3, supports managed disks. You can download the tool from the ASR Deployment Planner doc. For a complete understanding of how managed disks works, please refer to the detailed Managed disks documentation. Ready to start using ASR? Check out additional product information to start replicating your workloads to Microsoft Azure using Azure Site Recovery today. You can use the powerful replication capabilities of Site Recovery for 31 days at no charge for every new physical server or virtual machine that you replicate. Visit the Azure Site Recovery forum on MSDN for additional information and to engage with other customers. You can also use the ASR UserVoice to let us know what features you want us to enable next. Azure Site Recovery, as part of Microsoft Operations Management Suite, enables you to gain control and manage your workloads no matter where they run, including Azure, AWS, Windows Server, Linux, VMware, or OpenStack, with a cost-effective, all-in-one cloud IT management solution. Existing System Center customers can take advantage of the Microsoft Operations Management Suite add-on, empowering them to do more by leveraging their current investments. Get access to all the new services that OMS offers, with a convenient step-up price for all existing System Center customers. You can also access only the IT management services that you need, enabling you to on-board quickly and have immediate value, paying only for the features that you use.